This was always the threat we yelled before we opened our barely shut eyes to dash around and find our crouching, giggling, hiding kids during a neighborhood game of Hide-and-Go-Seek. It was a threat, especially if we counted too quickly or skipped some numbers in order to stymy their hiding plans. This is what school yelled as August ended while my heart was still vacationing in Montana, the suitcases were nagging to be unpacked, and Amazon Prime was delivering school books one at a time to my doorstep. I love school, but I love summer more. I still have that childhood anticipation that all wonderful things happen during the summer. It never comes quickly enough and it never lasts long enough. It’s when I slow down, bask in the sun, read, garden, and visit my relatives. But, even as a child, my love for books, new school supplies, and friends could always stir up anticipation for the first day of school, and each day after that. This year was no different. We began school. It wasn’t pretty, but we got ‘er dun. And while everyone else was staging adorable First Day of School pictures with matching Gymboree outfits on their Pinterest themed front porches, names artistically printed on hand-painted chalkboards, we did our own thang. And then we posted them a week later. ‘Cuz that’s how we roll at hOmE tEaChEd Academy, whether we’re ready or not. 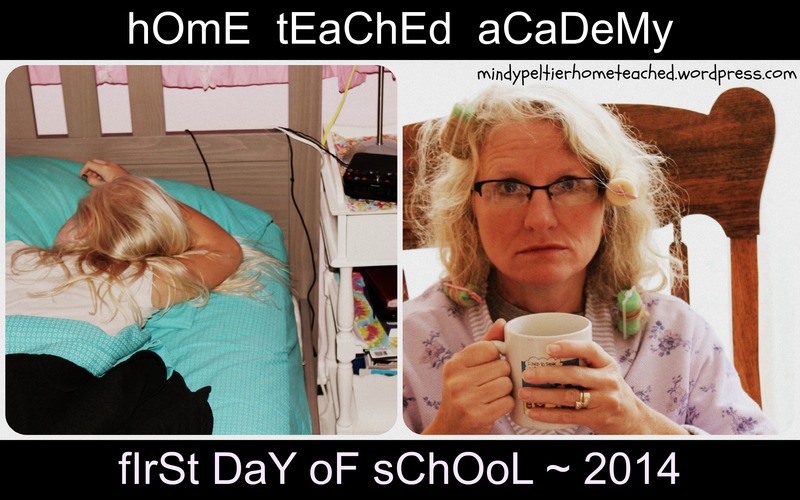 This entry was posted in Christian, family, homeschooling and tagged new year, SAHM on September 16, 2014 by Mindy. ← Momma Mindy’s Do It Yerself Spellen Krickulum. I agree, I enjoy school with my kids but I also love summer MUCH MORE. How long were you in Montana? I haven’t heard from you in foreverrrrrrrrrr. We were there almost two weeks. In fact, it is the first two week vacation Scott has taken in over ten years. We really NEEDED to relax. One of these years our vacations will coincide! We miss you guys so much.